Bure Valley Models at Bure Valley Railway01263 733858work Steam RailwayPart of the Bure Valley Railway, Bure Valley Models is based at our Aylsham shop. It was started by one of our Directors, Andrew, a model railway enthusiast. Purchasing items for his own model railway layouts, Andrew discovered that there was nowhere locally which sold the full range of model railway products at mail order prices. Today we carry one of the most extensive ranges of model railway products in East Anglia and all at very competitive prices. All the profits from sales of model railways are reinvested back into the railway. Part of the Bure Valley Railway, Bure Valley Models is based at our Aylsham shop. It was started by one of our Directors, Andrew, a model railway enthusiast. 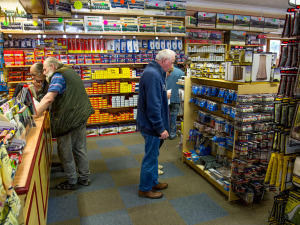 Purchasing items for his own model railway layouts, Andrew discovered that there was nowhere locally which sold the full range of model railway products at mail order prices.